We erect and maintain most of the stop, speed limit and caution signs on Township rights-of-way. Stop signs are inspected weekly and other signs are inspected each month. If you notice a missing sign, please notify this office so we may quickly replace it and avoid potential accidents. Stop Signs and Speed Limit Signs, new or changes to existing signs, are regulated by the DuPage County Engineer. Requests for signs or sign changes must come from the Township Highway Commissioner. 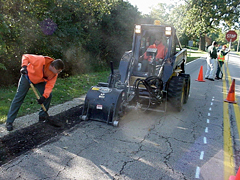 Do Not Contact the County directly; contact the Road District offic e, 630-231-8850 to start the procedure. Not all ditches need to be re-ditched. This work is performed April to October. 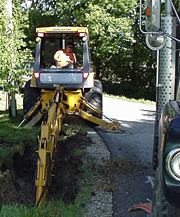 Ditching is scheduled by the area (subdivision), not necessarily by the address. Restoration to the worked area will be completed at a later time. You will be put on the ditch list when you call. We mow rural area rights-of-way 4-5 times per season. 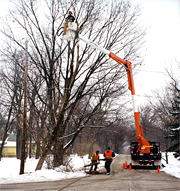 Trees that are dead on the Township road right-of-way are marked in the summer or early fall and then removed during the winter season. The Township does not prune or trim trees. Plantings (Keep landscape plantings off the R.O.W. Do not use the road pavement or R.O.W. for dumping gravel, mulch , black dirt, etc. All materials and/or equipment should be on the homeowner’s property. Advance notification is required when planning a block party. Residents assume complete responsibility for this activity which includes notifying the DuPage County Sheriff’s office as well as the appropriate Fire Protection District. At all times residents who live in the area must have access to their property. Signs are available at the Road District office. A deposit will be required when picking up signs and will be returned when signs are brought back to the Road District.